London South Bank University (LSBU) PhD student Omar Faruq Howlader has been awarded Best Paper by the International Conference on Control, Dynamic Systems, and Robotics (ICCDSR) for his development of a wall climbing robot – the first of its kind to be reported in literature. ICCDSR aims to bring together leading academic scientists, researchers and research scholars to exchange and share their experiences and research results on all aspects of Control, Dynamic Systems and Robotics. Omar’s extensive research into ground penetrating radar GPR antenna technology has led to the design of miniaturised GPR antennas that can carry out an inspection of a vertical concrete surface and detect a concrete reinforcement bar of 12mm diameter at a distance up to 50mm. “It’s really rewarding to know that my presentation has been recognised as Best Paper by International Conference on Control, Dynamic Systems, and Robotics (ICCDSR). “This innovative and highly significant project takes the current manual practices and transforms them into a more effective and faster automated robotic system. Ability to carry up to 11kg load. Can concentrate and magnify magnetic energy towards concrete reinforcement bars buried at 30 mm under a concrete surface. The robot can perform floor-to-wall and wall-to-floor transitions as well as transitions on inclined surfaces. Incorporated with a miniaturised GPR to make a wall climbing robotic GPR system. The robot can be used to develop wall climbing robots for both reinforced concrete and ferromagnetic surfaces. Option to integrate and adapt the current technology with systems such as ultrasound or a thermal camera to make it more versatile in different industrial environments. As a result of the excellence, research and innovation exemplified in his presentation, Omar has now been invited to submit an extended version of the original paper to a special issue of the international journal of control, dynamic systems and robotics. 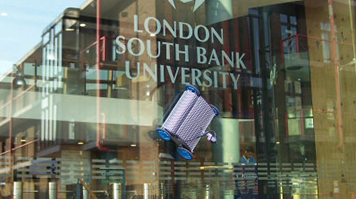 Find out more about Robotics and NDT Research Centre at LSBU.